Magazine Blank GC asked Neal Webb director of Energy Entertainments a few questions about this new project NightQuarter Spectacular. - So tell us about your new project with NightQuarter! How did it all come about? I have been working with NightQuarter, providing entertainment since the opening night back in November 2015. The very first theme that NightQuarter asked me to organise entertainment for, was ‘Coming to Life’. When I first visited the space it felt like something out of Berlin in Germany, with its industrial look and artistic, urban feel. I wanted to create a natural spectacle within this shipping container village, so I provided stilt walking performers dressed as trees roving through the market streets, handing out apples to visitors and tribal fire dancers accompanied by percussionists at the door to greet the guests and media on arrival. We also choreographed a tribal fire show and created a large fire sign with the words “NightQuarter” along with their logo, which we set alight throughout the evening. Since the opening night, my company Energy Entertainments has had the opportunity to perform for various events at NightQuarter and has always provided a safe and exciting show. I believe communication is the key to a successful relationship and I know this was a strong reason why NightQuarter asked me to create “NightQuarter Spectacular” with them. It’s cool I have the opportunity to work alongside and showcase the best talent we have in our area. Every Friday and Saturday night at 6.30pm on the main stage, we present a different, thrilling show. So far we have seen; circus acts, comedy acrobatics, fire shows, aerial performances, dance routines, chainsaw juggling…and that’s just in the first month! It has been a lot of fun collaborating with the performers, sound and lighting guys and the NightQuarter team. We have been mixing up the theme, lighting and stage props each evening and displaying an awesome backdrop designed by local artist, Dion Parker aka DionsRibs. We’ve created intro announcements and exciting videos to build the atmosphere before the show begins, inviting the audience to prepare for a spectacular stage show. It’s a great opportunity to invite local performers and specialty acts to share their show on big stage for the public to watch on a regular basis. It has also been a really good feeling to be able to ask the performers to create something new and encourage them to put together there best show to date. We could all use a reason to add a little drive in our lives. - Sounds like a great way to get a great variety of performing artists into the public eye on a regular basis. Can you tell us about some of the artists you will be featuring in April? We’ve booked some great entertainment for April and May and some of their bios are below. The Physical Comedy of James Lamont, performing acrobatics, feats of strength and balance, razor sharp juggling and unicycle antics. The Ladies of the Lounge, a dance performance company mixing the ancient feminine art form with modern interpretations – expect the unexpected! Rhett Morrow presents the Kaboodle Circus Show. Rhett is eccentric, bubbly, crazy and extremely funny. Combining unicycle antics, balance acro, juggling and comedy, kids and adults will love this wacky performer as he blows their minds! Asher Bowen-Saunders, dancer and aerialist, explores the magic and loneliness of the life of a vagabond with the spirit of a child. Caught between the worlds of reality and imagination as a young boy drifts through time; walking alone as his day slides into night. Matthew Acro Swan will be clowning around on stage while performing acrobatics, juggling acts and slapstick comedy that will make young and old cry with laughter. Also on the cards: a Parkour free-running dance group; a breathtaking break dancing performance; glow performances; stunt shows from Joel Fenton the Idiot Stuntman and Bryce Watts cracking out flaming whips and Michael Jackson dance moves. 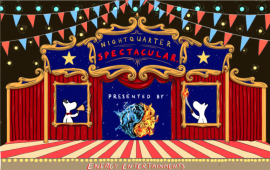 I’ll also be performing my high-energy fire shows on a regular basis at NightQuarter Spectacular. 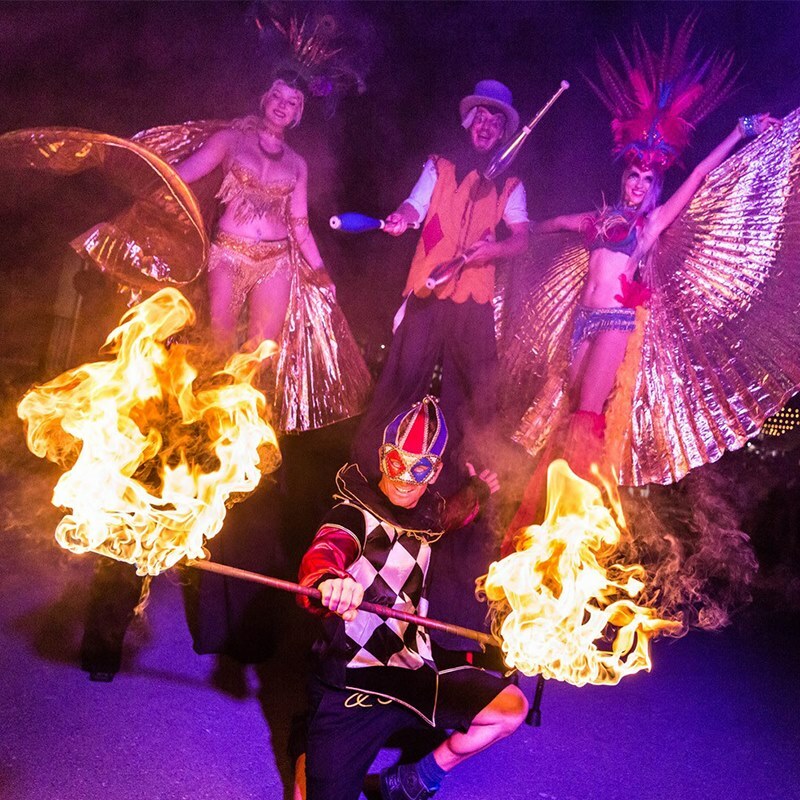 Expect the funkiest upbeat tunes and dance, tribal fire and percussion performances, duo collaborations with Ruby Ripe on our 1920s glamour show, Spanish fire dance, disco madness, martial art shows and a whole lot more! We’ll be keeping it fresh, so come down and check out the shows. So far we have had some amazing feedback and the audience is growing every week. 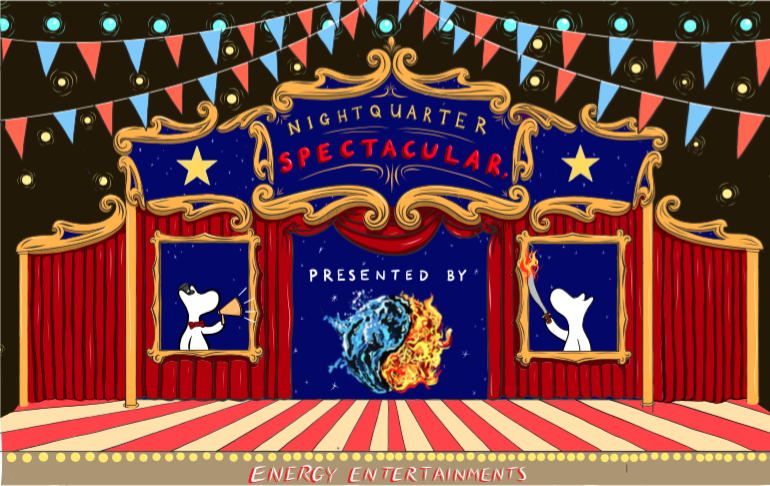 I’m planning on increasing the production at NightQuarter Spectacular and creating a full night of diverse high-energy entertainment with the best specialty act stage performers I can find. Stay tuned because it’s coming soon! - How can people find out what’s happening, where, and all the other details? - What else is happening with you in 2018? The future is looking good for Energy Entertainments with various projects on the cards. We have brought together a team to perform at the Commonwealth Games Closing Ceremony on 15th April. During the Games, we also have performers entertaining the public at the Renaissance Shopping Centre in Surfers Paradise and performing every weekend at NightQuarter for Festival 2018. I have been collaborating with Chris James, professional BMX rider and filmmaker Matty Rogers, to put together another epic BMX fire video. Last year, we made a video called ‘Bring The Heat’ for Spent Clothing. This year we have raised the bar, filming at Elanora Skate Park with new fire equipment and gnarly BMX tricks, flame throwing swords, fire whips, back flips, roofs on fire and a little helping hand from the local police department! The video is for PSD, an American underwear brand and will be released next month. I’m also heading back to Europe in August to perform at a wedding and of course, make a stop at my 2nd home, Ibiza in Spain, to perform in the amazing venues. I love that island. After that, I’m back to collaborate with Cindy, the organiser for Buskers by the Creek 2018. Last year’s heavy downpour during the festival has only made Cindy more determined to create an amazingly epic jam-packed festival! Last year, I organised a 6-person Pirate and Mermaid show that had to be canceled due to the rain. In 2016, we staged the fire shows on the floating halfpipe, with flaming BMX riders back-flipping into the creek. How are we going to beat that at BBTC 2018? You’ll have to come down to Currumbin and check it out in October. This year, I’m also planning to embark on an adventure to Mexico to continue my documentary project ‘Heart of Fire’. Episode 1 “Polynesian Warriors” has had a great response and been entered into various film festivals around the world and is still building traction. I’m going to use the money generated from that to fund Episode 2 “Myan Fire Warriors”. There is a lot of organisation to be done but I’m aiming to get there by the end of the year. The great thing about running Energy Entertainments and being involved in the entertainment industry is that I never really know what’s around the corner. A client calls with an event or idea and requests a proposal and before you know it, I’m immersed in that project, coming up with creative and exciting shows. I like the unknown and look forward to more opportunities this year. If anyone is looking for high-energy entertainment for an event, give me a call or visit the website.